Lake Piru is a pretty good all around fishing lake. Largemouth bass and catfish are most popular with quality catches of both common. Piru also has a good population of crappie and red ear sunfish. Lake Piru is located in Ventura County, California, in the Los Padres national Forest next to the Sespe Condor Sanctuary. From our foothill lake, you are less than an hour away from the uncrowded beaches of Ventura or Hollywood and Universal Studios. 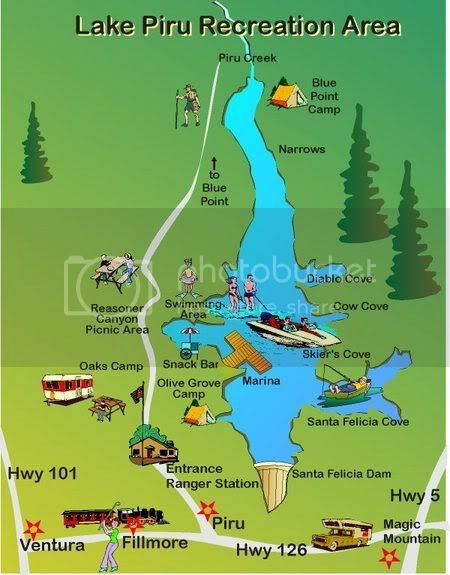 We offer visitors excellent boating, trout and bass fishing, camping, water skiing, swimming and hiking. Traveling on Highway 101, in Ventura, take Highway 126 east to the Piru turnoff. From Highway 5, just north of Magic Mountain in Valencia, take Highway 126 west to the Piru turnoff.